Most common negative Dressage comment: "stiff through back"
End result: Connor's back loosens up and he carries himself better than ever. Training exercise in my lesson: 3 poles end to end, with the top and bottom ones being vertical, and the middle one being horizonal, so they make a tiny zig zag. I had to keep him together and make some very sharp turns to hit the correctly colored pole that she would call out for me to go over. End result: Some improvement in the patience and sitting departments, but it was hard for both of us. When he wasn't put together, we felt like a pile of limbs trying desperately to throw ourselves at the poles. But there were some good moments. Brown keepers on my black bridle. Details, details. Hard to see, but that line on his lower lip was the "high water mark" of his foamy mouth during the Dressage part of our lesson, and you can see the foam still sitting behind the flash strap. That's the most foam I've ever gotten out of him, and given how well he was carrying himself in the Dressage part of our lesson, I wasn't surprised to see it. Definite improvement. Love your trainer. :) I would like to see a diagram of the pole exercise. How are you liking the Micklem? I've been curious about trying one on my boy, but don't know if it's really going to make a difference. Steph, I love it. It was the direct cause of the biggest one-day turnaround in the way he goes that I've ever seen. 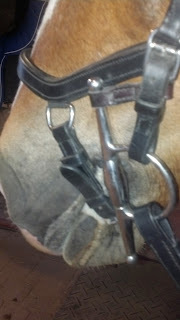 He is much lighter in the bridle now, and doesn't lean on me as much, and he's mouthing the bit a lot more. Not a miracle for every horse I've heard, but definitely made a huge difference for Connor. I have a proper review of it a few weeks back if you'd like to read that.